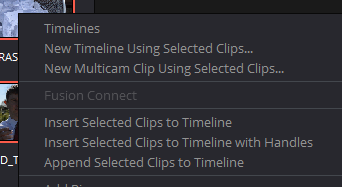 Probably the most common way to create new timelines is to simply select clips in your project panel and right-click on them which gives you the following options. The first option is the same as discussed in the previous blog (Part 1). We will look at the following ones. ‘New Timeline Using Selected Clips …’ will create a new timeline with the clips you have selected, although the order of the clips will remain in the sort order that you have in your bin. So, if you want to have clips in an order other than sorted this won’t work. 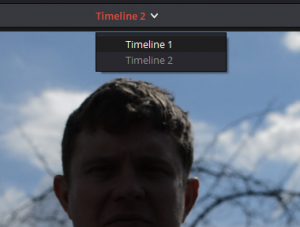 To create a timeline that will allow you to select clips in any order regardless of the sort order isn’t directly possible – although – if you create a new empty timeline you can then select clips in whatever order you like and add them to the empty timeline and at that point the selection order will be respected. It really depends on how organised you are when you add metadata to your clips and give them working/Display names. If you have ordered the clips when adding metadata then you will be able to create your timeline using the ‘New Timeline Using Selected Clips…’ method as long as you select all the clips and they are sorted into the order you wish them to be in your timeline. Otherwise, you will still create a timeline but may need to move/add/remove clips to get them in the order you want (more on this in another blog). PLEASE NOTE: – You can create as many different timelines as you want – there is no restriction. If you have used a Timelines bin or a Timelines Smart Bin you will easily be able to find them. However, you can also select them over the timeline monitor in the UI. TIP: If you are in the Edit page and have a 2 up monitor display (ie trimmer and timeline monitors) you can toggle between then by hitting ‘Q’ – you can tell which monitor is active as the text will turn orange. We will be covering Multicam timelines and the Multicam workflow in future tutorials. The next three options – ‘Insert Selected Clips to Timeline’ – ‘Insert Selected Clips to Timeline with Handles’ & ‘Append Selected Clips to Timeline’ are not actually about creating new timelines but about adding selected items to an existing timeline. ‘Insert Selected Clips to Timeline’ simply inserts selected clips at the position of the playhead. However, once again, the sort order rather than the selection order will determine the order the clips are added to your timeline. ‘Insert Selected Clips to Timeline with Handles’ is designed to be used with clips that don’t have In and Out points. What will happen is if you choose a clip or clips without In and Out point and this option, Resolve will add each clip but trim them removing the default handle length (usually 1 second) from the start and end of each inserted clip so you can add a transition without issue. Lastly, ‘Append Selected Clips to Timeline’ simply adds the selected clips in their sort order to the end of your timeline.